issues to the type of experience that Zimbabweans have faced. and situations around the world. they wanted to. Most Zimbabwean migrants live in South Africa. migration of the 21st century is directly and indirectly political. collapse, but it is a collapse that has occurred for political reasons. the result of a long history of inequality, racism and exploitation. were interwoven beneath a Zanu-PF government led by Mugabe. dispersion of Zimbabweans occurred in this period. city of Bulawayo, while others left for Botswana and South Africa. decades before the globally-publicised land invasions of 2000.
friend. Or so they thought. him as 117 percent disabled. Brain dead would be more accurate. and they received vast quantities of gold and real cash in return. that was most telling and most disgusting. And what misery it was. faceless victims of the Zanu-PF killing fields. commission) so a second round of presidential voting was called. have lifelong disabilities—and tens of thousands were displaced. week to go, hoping to spare the people further suffering. with these serial abusers—and, of course, the abuse continues. are still some way from achieving peace and democracy. dispersion. They are internal and political and are wholly manmade. supported by his kleptocratic and autocratic allies in the region. disinterest. They trade on an outdated reputation and do nothing. till now, been the group most capable of overthrowing the regime. traditions and the fear of short-term diplomatic fallout. to claim that any regrettable events pre-date their involvement! pockets of the regime at a time when it needed election resources. riding roughshod over anyone unfortunate enough to be in the way. of assisting the democratic process. choose and change governments whenever they want to. misery to the rest of the world. versus the provision of aid, as if these are the only alternatives. elites pushed out by drilling boreholes or conducting seminars. money into critical services, like health and education. which has seen hundreds of millions of dollars in profits go ‘missing’. there is no reason to be optimistic,” Mashiri said. appearing to bow to pressure to allow Zimbabwe to resume exporting. threaten the integrity and reputation of the entire trade. the 2012 budget was “pro-poor” and focused on empowering youths and women. health care has been given a US$445 million boost. admitted about US$2 billion is needed for the sector. the Budget, as it was happening. the confusion over whether he had married or not. Tsvangirai into marrying her, using intense pressure from the media. marriage. Instead Deputy Prime Minister Arthur Mutambara stood in for him. congratulate the Prime Minister on his marriage”. President of the Senate then asked Moyo to withdraw the congratulations. 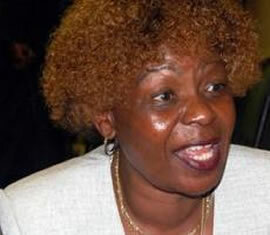 is the ZANU PF MP for Goromonzi West, Biata Beatrice Nyamupinga. happened, people will continue speculating,” one listener wrote in. Co-Home Affairs Minister Theresa Makone has angrily denied accusations that she is meddling in the private life of Prime Minister Morgan Tsvangirai. This follows the confusion surrounding news reports of whether Tsvangirai had married a Harare businesswoman or paid ‘damages’ for getting her pregnant out of wedlock. She went on to say: “I honestly believe that if we went into elections right now Morgan Tsvangirai would win the elections and more than that he will run this country for the next ten years after elections. I have no ambitions to become even the Secretary General or Organiser or anything in the Standing Committee.” She said her position as Chair of the Women’s Assembly was the highest ‘privilege’ she could attain in the party. “I don’t know what Pedzisai Ruhanya’s problem with me is? I don’t know him from a bar of cheese and he seems to particularly enjoy taking a dig at me at every turn. I’m actually going to sue him and I will sue him to the last cent because I think this man is getting carried away because I have never responded to his accusations, now I am getting sick and tired,” Makone added. stations since independence in 1980.
sterio under the AB Communications stable. applicants, was denied one of the two licenses that were on offer. licence and Zanu-PF aligned Zimpapers. Radio the country’s first two commercial private radio licences. The two radio stations are owned by companies with links to Zanu-PF. Nyanga North as a potential parliamentary candidate for the party. provision of commercial radio broadcasting services of national coverage. said Mahoso while announcing the winning two radio companies. radio licenses for 14 urban areas. Southern Africa (MISA) Chairman told Radio VOP that: “We are not surprised. It’s a sham. What is the difference between Zimpapers and AB Communications? Four media companies were vying for the radio licenses including Radio VOP. Information on Tuesday for ZBC and CCTV to share news programming. (185 miles) south of Harare. said, according to the state-run Herald newspaper. speech again threatened to punish gay Zimbabweans. in their constitution, which will clear the way for new elections. referendum on the charter expected only next year. saying the most likely possibility were coup d’état. African people can never be influenced to rise against their leaders. Tunisia, Ivory Coast and Egypt. friend Muammar Gaddafi being toppled and assassinated. dangerous to rule out the possibility of uprisings. force the company to give some of the shares to the employees. homosexuality that he said was un-Christian and un-African. people that he has described as worse than pigs and dogs. saying countries that want British aid should accept homosexuality. “To come with that diabolical suggestion to our people is a stupid offer,"
they do not want gay rights enshrined in a proposed new constitution. protect the rights of homosexual people. conservative and view homosexuality as an abomination. ONE in two Zimbabweans has paid a bribe to a police officer in the last 12 months, a shock new report claims. A staggering 36 percent of people who have dealt with the Zimbabwe Revenue Authority (ZIMRA) say they have also paid bribes, according to the survey of six Southern African countries published by Transparency International this week. On a perception scale of one to five, where one means “not at all corrupt” and five means “extremely corrupt”, Zimbabweans gave the police a four; politicians, civil servants and the judiciary a three while journalists, NGOs and churches got a two. Of the 1,000 Zimbabweans surveyed, 42 percent said they paid bribes to “speed things up”, 30 percent to “avoid a problem with authorities” and 28 percent “to receive a service they are entitled to”. The survey of more than 6,000 people in the Democratic Republic of Congo (DRC), Malawi, Mozambique, South Africa, Zambia and Zimbabwe between 2010 and 2011 also found that across the region, 62 percent of people believe corruption has become worse in the past three years. The survey shows that the DRC is the most corrupt in the region, topping the bribery scale in all but one of the nine key service providers analysed. The DRC (22 percent) only comes second best to Mozambique (35 percent) in medical services corruption. Chantal Uwimana, Transparency International’s Regional Director said: “Governments must wake up to the fact that people will not tolerate corruption anymore and start reforming weak institutions, particularly the police. The ‘Daily Lives and Corruption, Public Opinion in Southern Africa’ makes for grim reading, but there is also some good news: 80 percent of those interviewed said they were prepared to get involved in the fight against corruption and three-quarters said ordinary people can make a difference in the fight against corruption. City Council public relations officer Leslie Gwindi has said. Gwindi said: “There has been an increase in patients carrying the bacteria. We are talking of numbers in excess of 500 right now. He defended water cuts in areas such as Highfield. does not mean that water cuts will stop,” said Gwindi. sanitation has been attributed to the typhoid outbreak. the country’s largest platinum miner. controlling stake to local blacks. banks Standard Chartered and Barclays. name of the people but benefited his top lieutenants the most. police officer Inspector Petros Mutedza. Musendekwa and Mtisi Legal Practitioners. September to convince the court that Madzore was not a flight risk. September as proof to show that he was not on the run. Mutedza was murdered in Harare’s Glen View suburb in May this year. murdering a police officer, Inspector Petros Mutedza. hide from the police since the alleged murder of Mutedza. Mutedza and hence the police had failed to arrest him. connection with the murder of a police officer. month. Justice Mwayera ruled that the MDC-T youth leader was a flight risk. take to next May to hold a national referendum. stage for a new round of national elections. Elections in 2008 were marred by violence that claimed hundreds of lives. Celebrity Actor Hugh Grant speaking at the Leveson inquiry on the culture, practices and ethics of media in UK warns that attempts to regulate press will lead to Zimbabwe. The actor referred to Zimbabwe in number 4 of his "10 Myths of the Popular Press". Reader beware that this article is not to assert or deny Hugh Grant's myth. Whether regulation of the press will make Britain like Zimbabwe is a myth or not is not the aim of this article. It is obvious from his statement that Britain does not want to be like Zimbabwe. What is Zimbabwe like when it comes to Press Regulation? Here are some of the details. This Act was passed into law in 2001. It is a law used by Mugabe's ZANU PF to essentially monopolize the broadcasting airwaves. The government's Zimbabwe Broadcasting Corporation (ZBC) is currently the sole free-to-air broadcasting service provider. No independent broadcasting service provider has ever been licensed in Zimbabwe. Ordinary Zimbabweans are subjugated to constant ZANU PF propaganda and misinformation on television and radio by ZBC. The result of this is that Zimbabweans are unaware of the detail of what is going on in their backyard and and have to resort to the World Wide Web and satellite broadcasting services from foreign nations for the true Zimbabwe situation. One of the most recent draconian laws passed by the oppressive regime is the Interception of Communication Act (2007). It targets ordinary internet, post and telephone users as well as media practitioners who use the World Wide Web as their medium. The purpose of the act is to establish a spy center operated by government officials, "whose function shall be to monitor and intercept certain communications in the course of their transmission through a telecommunication, postal or any other related service system". Internet Service Providers (ISPs) are required "to install hardware and software facilities and devices to enable interception of communications". The ISPs in Zimbabwe are obliged by law to redirect their data "in a manner in which information can be re-routed to government's monitoring center". Enacted in 2005 to close the loopholes left out by AIPPA (2002) and POSA (2002). The Criminal Law imposes even harsher penalties to its victims. Under this law it is an offense or anyone in or outside Zimbabwe to publish or communicate to any other person a statement which is wholly or materially false with the intention or realizing that there is a risk to public order, defense or economic interests, undermining public confidence in a law enforcement agency and disrupting essential service. Reader note an offense will have been committed even if the publication or communication does not result in any of the scenarios stated above. Such is the nature of journalism in Zimbabwe. Mugabe also uses sections of Criminal Law for his own personal use. It prohibits the making, publicly and intentionally, of any false statement (including an act or gesture) about or concerning the President or Acting President if the person knows or realizes that there is a risk or possibility of endangering feelings of hostility towards or causing hatred, contempt or ridicule of him/her, whether in his official or personal capacity. The GLAA increased penalty fines for various crimes and media practitioners were not let out of the loop. Fines for publishing false statements prejudicial to the state were increased by hundred fold. This is what Zimbabwe is in Hugh Grant's '10 Myths of the Popular Press' and as can be seen in the context of his words and my further elaboration, it is nothing good. Hugh Grant paints Zimbabwe as a futuristic, mythical condition which British media should avoid. He references to Zimbabwe in a statement existing only in the imagination (myth). What a reader might overlook in Hugh Grants comparison of British media to Zimbabwe media is that Zimbabwe is real. Far from being an imagination the Zimbabwe situation is literally a bloody reality. Muffling the media's voice is only the foundation of Mugabe's kleptocracy. The walls are built by corruption and greed. On the roof you will find kidnappings, torture and murder. Zimbabwe has a population of 12 million, 3 million live as exiles. was held in South Africa in January of that year. had gained over the preceding five years that it had existed. will be last he hears about that woman. comes to ZANU PF and the MDC. been together in their hitherto covert relationship. dictatorship such as ZANU PF. all to see. In him people are very unwittingly producing another Mugabe. The Minister of Finance will deliver his twice-postponed 2012 Budget Statement in the House of Assembly this afternoon. Tuesday The acting chairperson of the Portfolio Committee on Budget, Finance and Investment Promotion reported to the House that in a letter to his Committee the Governor of the Reserve Bank had charged the Committee’s chairperson, Mr Zhanda, with putting pressure on the Governor in an effort to get him to favour Mr Zhanda’s personal interests. [Under Mr Zhanda’s leadership the Committee has been investigating aspects of Reserve Bank business.] There was no debate, as the Speaker said he would make a ruling on 24th November on what action should be taken. As required by Standing Orders, Mr Zhanda has stepped down as chairperson of the Committee pending the resolution of the matter. The House then devoted most of its short sitting to hearing the final contributions to the debate on the condolence motion for the late General Mujuru. Hon Bhasikiti, the motion’s proposer, wound up the debate and the House passed the motion. There was celebratory noise before the sitting commenced, with congratulations being accepted by ZANU-PF MP Biata Nyamupinga, sister of the paparazzi-alleged bride of the Prime Minister. A congratulatory remark was made by MP Mazikana, ZANU-PF, during proceedings, but the Deputy Speaker ruled that celebrations could continue after the session – which they did. There had been no official confirmation of the marriage. Wednesday – Question Time Several MPs put questions “without notice” to Deputy Prime Minister Mutambara on MPs’ remuneration. One asked the Minister of Labour whether she could assist MPs in their plight; she replied it was outside her mandate. The DPM undertook to report back to the House next week after discussing the matter with the President and the Prime Minister. Tuesday The Senate sat for only 13 minutes. There were no contributions to the debates on the motions currently before the Senate. Wednesday The Senate sat for 24 minutes. After a brief final contribution to the debate on the motion of thanks to the President for his speech opening the current Session by Senator Simon Khaya Moyo, ZANU-PF Chairperson, the motion was approved. In concluding his winding-up speech Senator Moyo also, on behalf of ZANU-PF, congratulated the Prime Minister on his “marriage”. MDC-T Senators objected and their whip Mrs Gladys Dube demanded that that Senator Moyo withdraw this, saying “you can’t rely on newspapers” and no marriage had been confirmed. The President of the Senate then asked Senator Moyo to withdraw the congratulations. Prime Minister’s Question Time in the Senate Prime Minister’s Question Time will not take place this Thursday because of the Budget presentation. Both Houses sat on Tuesday 15th November only. Condolence motions There were brief contributions to the ongoing debates on the condolence motions for Professor Mukonoweshuro and General Solomon Mujuru. No Bills dealt with No moves were made to restore the Human Rights Commission Bill and the Electoral Amendment Bill to the Order Paper. At this rate neither Bill is likely to be proceeded with this year, as Budget business is likely to dominate the scarce remaining Parliamentary time before the customary December recess. Report on APU Conference Senator Mumvuri presented a report on the Conference of Speakers of Parliaments of the African Parliamentary Union that was held in Equatorial Guinea at the end of 2010. Senators congratulated President of the Senate Ednah Madzongwe on her election as a Vice-President of the APU at the conference. The chairperson of the Zimbabwe Media Commission [ZMC], Mr Godfrey Majonga, has said that the Commission would establish the Media Council before the end of November. He said letters had been written to appropriate organisations [see below] asking them to nominate representatives for appointment as members of the Council – each organisation has been asked to put up three names. Mr Majonga pointed out – correctly – that the Access to Information and Protection of Privacy Act [AIPPA] obliges ZMC to set up the Council. [Section 42A(1) says “the Commission shall appoint a Media Council”. This section and other sections relating to the Media Council were inserted into AIPPA by an amending Act passed by Parliament in late 2007 as part of a “package” agreed to by all three main political parties ahead of the 2008 elections]. · 2 members representing the legal profession, one selected by the Commission from a panel submitted by the Law Society and the other from a panel submitted by university law faculties. · when the Council finds a journalist or mass media service guilty, recommending to ZMC the penalty that should be imposed by ZMC [again, the final decision and responsibility for taking action rest with ZMC]. No Bills or Acts were gazetted. Statutory instruments under the Customs and Excise Act were the only ones gazetted [electronic copies NOT available].